I've started using the Garnier Micellar water and I swear by it. I can't believe I went so long without using it. I don't use micellar water very often because I have got Nivea and it's really bad. I don't feel any change after using it! The Garnier Micellar Cleanser is great, I also pick mine up from savers- usually a lot cheaper than Boots and Superdrug! Great post! Great post, most of the skincare products I use are Simple as my skin is quite sensitive and lots of other products irritate my skin. I'm trying to try out new products and this post has helped, thanks! Great post, I love skincare posts!! I also have started using the micellar water, I really love it, it's so gentle on my skin!! And I love Garnier products! I'd love to try out that toner, think I'll have to pick it up! Lovely Post! 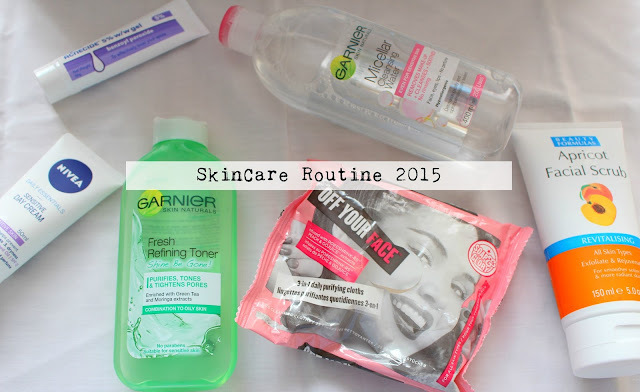 I love Garnier products and I also have an apricot scrub, I love! Also love your new banner! I love the Garnier micellar water! It's so good. I really like the boots basic spot treatment as well. It's inexpensive yet really does the trick. Need to get my hands on the Soap&Glory wipes. Sounds amazing! Your room is SO CUTE! If you came in mine right now you'd see the absolute state it is in since we've moved in. I need to get it all done and do such a post like this, I like being nosey into peoples lives!